Southern California Events, Coupons, Reviews! Fall is my absolute favorite season of the year (I feel like I say that all the time), and Halloween is one of my absolute favorite holidays. There's just something about creepy things that really intrigues me. 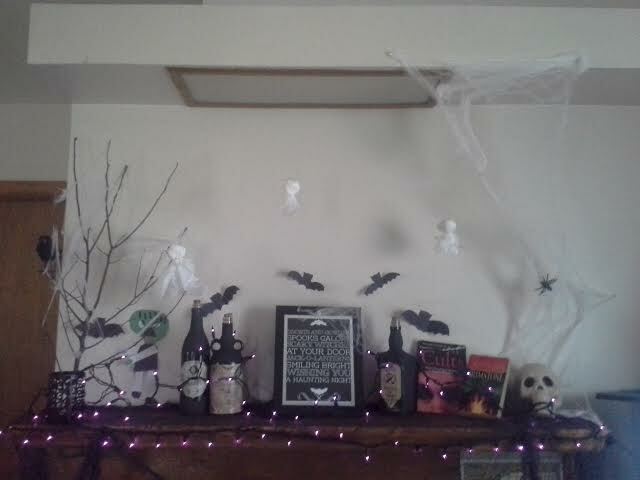 Recently, my son and I jumped into the "Hallowsday" spirit and took to Pinterest to start gathering ideas for decorating our mantel. This is what we had last year...While it may look a little elaborate, we didn't spend much money at all. As a matter of fact, most of our items were DIY. Check out what we used and how much we spent. * This post contains affiliate links. I may be compensated if you make a purchase using the links within this post. Please view my full disclosure. I've had empty alcohol bottles lying around for awhile now, and thanks to Pinterest's spooktacular Halloween decorations, I was able to find a cool Halloween decorating idea. 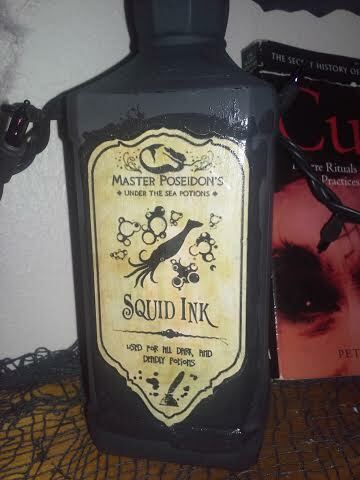 Squid Ink Potion, anyone? 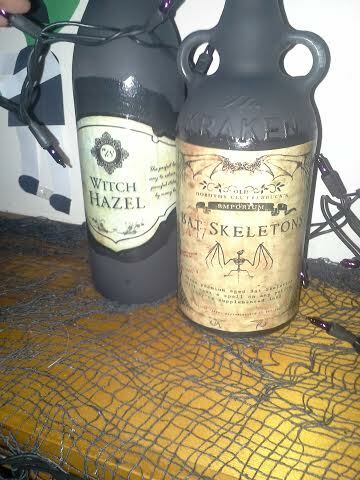 Creating Halloween "Potion" Bottles was super easy. Since I didn't have any leftover corks from all the wine that I consume (of course I threw them away, as not to be a hoarder, then realized I could have used them -_-), my husband used brown paper bags to create makeshift corks. I attached skull and crossbones stickers on top. Pinterest has so many free Halloween printables on Pinterest, including free Halloween potion bottle labels. 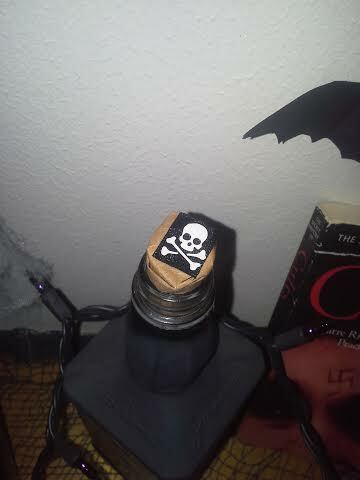 I affixed mine using Mod Podge, but if you want to take the easy route, Amazon carries Halloween Potion Bottle Sticker Labels that require little effort on your part. 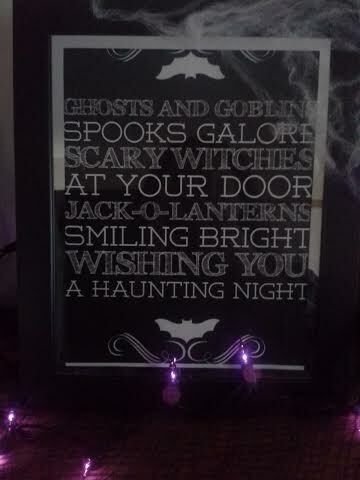 Speaking of Halloween printables, I knew I wanted an image as the "centerpiece" on the mantel, and I found this lovely image that I printed and framed. 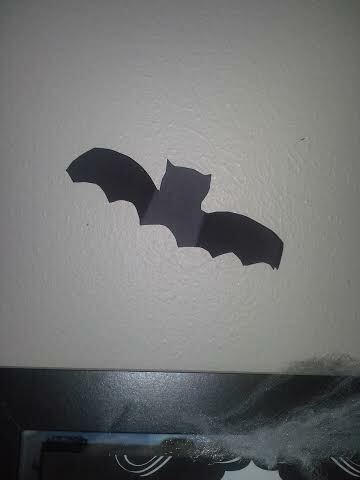 Carter helped me cut out some cute little bats to hang on the wall (we used masking tape, as it's easier to remove without peeling the paint or leaving a stain. 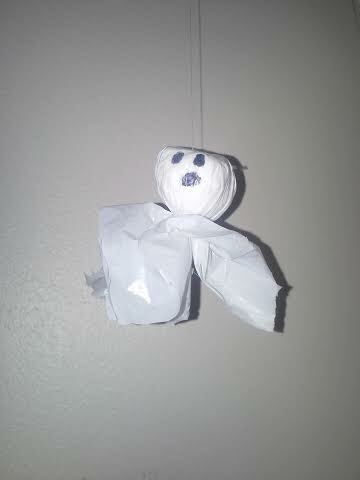 We also created spooky little ghosts from a trash bag and balled up paper towels. We tied the head in place with small rubber hair bands and used a permanent marker to draw on the face. Finally, I tied the ghosts to the light fixture above the mantel with white thread (to blend in with the wall) so they appeared to be "floating." 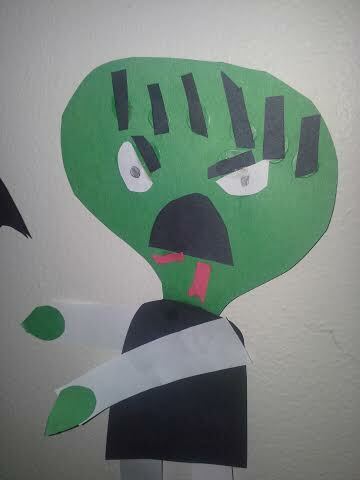 Carter also created this cute little zombie to go on the wall. 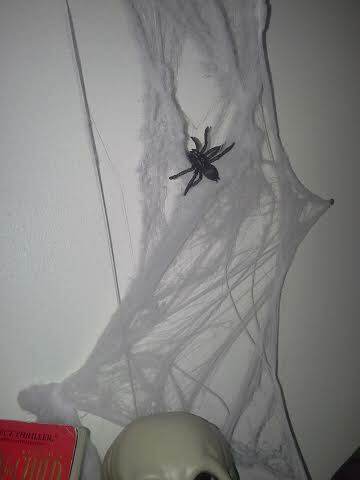 He created it with construction paper, scissors, and glue. Out back, my husband grabbed a small branch that resembled a tree so we could go a bit further in our decorating efforts. 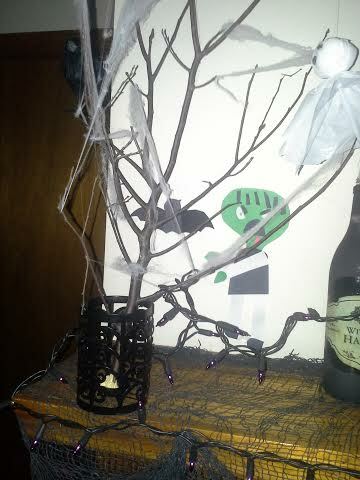 I used an old tea-light candle holder to hold the tree, and we added some fake spider web for effect. 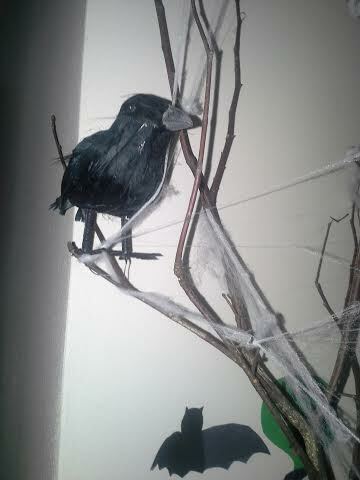 Now, when it comes to Halloween, Dollar Tree is my go-to destination for any extra goodies that I can't make at home. Here are a few of the items I was able to pick up. 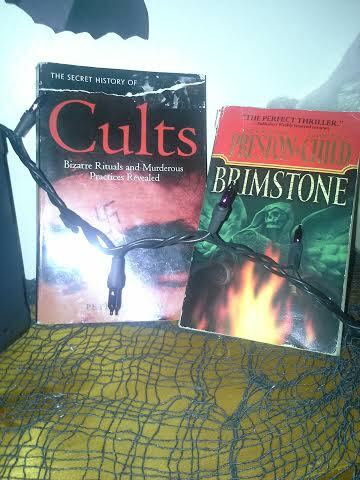 Even after all of our decorations, there was still some space left on my mantel, so I decided to add a couple of scary books that I own, just to fill in the extra space. 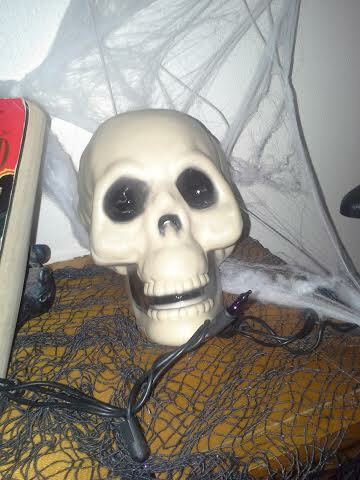 I was also able to purchase purple Halloween indoor/outdoor lights for cheap. At my local Dollar General, I picked up a shaggy looking cover that I used on top of my mantel—and for only a buck! All-in-all, we spent less than $20 decorating our mantel. I'd say we did a pretty darn good job. I hope you all have a safe, spooky, and exciting Halloween!